Renewable energy is essentially energy produced from sustainable resources that can be naturally replenished. The resources used for renewable energy generation are infinite, so they will exist long after we have run out of coal, gas and oil. We have been dependent on fossil fuels for well over a 100 years, but we have dwindling fossil fuel reserves and the last few years has seen the demise of cheap oil. The International Energy Agency (IEA) recently confirmed that every fossil fuel resource we rely on today will simply not be able to keep pace with demand. Our entire way of life and all of our current economic estimates are built around assumptions that there will always be more energy available when we need it. But this is a flawed assumption and that's why we're about to see the biggest energy transition the World has ever witnessed! Within the next decade or so, the simple fact is that supply will not be able to keep up with demand for oil. Virtually everything we use and consume today relys on oil being cheaply available. There's a lot of interest surrounding the extraction of shale gas and hydraulic fracturing, known as fracking. Some energy companies see it as the most important development in the global energy market in decades, but from the environmentalists point of view its a catastrophe of Biblical proportions that must be stopped at all costs. Whatever the true facts of the matter, it seems crazy that we would even consider such a process that has largely unknown effects on the earth and water supplies, when we can be harnessing so many other alternative sources of energy that have little or no negative impact on our planet. We have two stark choices: Continue with an energy economy that is unsustainable and damaging to the environment or use the coming energy crisis to ramp up the production of renewable energy alternatives. Renewable energy solutions, whether solar, wind, geothermal or biofuels will usher in a new way of life and a new generation of wealth for early stage investors. Of all the energy freely available to us, the sun is by far the largest. The amount of solar energy the Earth receives every minute is greater than the amount of energy from fossil fuels that the Earth uses in a year! Solar power is one of the more mature alternative energy sectors. The idea is not new. A type of concentrated solar power system was used in the 1870s to drive steam engines. Modern solar energy technologies harvest the sun's energy waves. Photovoltaic (PV) cells make electricity from photosensitive materials that respond to the visible light spectra of sunlight. Solar thermal technology such as hot water systems and concentrating solar power (CSP) systems, directly harness heat from infrared light spectra. Solar systems have seen massive innovations, refinements and cost reductions in the last few years. There is now the potential to make solar so cheap and cost effective that it can be deployed anywhere. In the last decade the annual growth rate of solar installations has sky rocketed in countries such as Spain,Belgium, Republic of Korea, Portugal and Germany. As the industry further matures the percentage growth of installments slows but the amount of solar panels being produced and installed is much greater. This is good news for investors. Five countries that could lead the way in the next five years are: Italy, U.S.A, France, India and China. Good opportunities are also emerging in Canada, Australia and Central Europe. Canada has burst onto the green scene in a big way. Some provinces are planning to get rid of fossil electricity generation entirely in the next few years!. But it is the U.S.A that is considered the sleeping giant of the solar industry. We believe it could be about to wake up! The US government's recent stimulus package has given a real boost to the solar industry. In the short term there are still some hurdles to be overcome - at the moment solar power and virtually all other alternative fuel sources cannot compete with coal and oil on a cost-per-kilowatt basis. Currently, solar power can be produced for roughly 15 cents/kW while gas and coal power comes in around 4-5 cents/kW. When traditional fossil fuel prices rise, alternative energy becomes more competitive on cost, especially when generous government subsidies are added in. Investment opportunities abound for low-cost, high-quality providers. Wind power has a long history - boats were propelled down the Nile in ancient Egypt by it, windmills came into existence thousands of years ago in China and wind turbines first appeared in Denmark around 1890. Wind power is primarily a utility-scale technology, with hundreds of turbines erected in huge wind farms.There are already hundreds of active wind farms across the globe. Even so wind power still makes up only about 1% of the world's total energy use. Wind is the fastest growing of all the renewable energies. Europe in particular, has built a flourishing wind industry in the last 10 years. The UK believes offshore wind can provide 25% of the country's electricity demand by 2020. But this is dwarfed by China's wind power ambitions of 100 gigawatts by 2020! According to the Department of the environment, wind resources in the U.S. can provide 5,800 quads of energy each year. That's about 15 times the current global energy demand! By 2030 wind projects could be providing 20% of all U.S electricity demand. Government support in China, USA and the new coaltition government in the UK is providing fertile ground for opportunity. Billions of Euros have already been spent on installing onshore windfarms in Europe over the past decade. But now attention is turning to offshore windfarms. GE plans to invest $453 million in offshore wind technology in Europe until 2020. Other major companies investing heavily in wind power are: Statoil, RWE AG,Centrica Plc,Siemens AG and Vestas Wind Systems. The cleantech revolution is a huge undertaking and there are massive opportunities for those who invest in the companies that will facilitate these massive offshore wind projects. In simple terms, in a traditional geothermal plant, steam or superheated water from deep inside the Earth is used to drive a turbine and generate electricity. Geothermal power could prove to be the cleanest, greenest and most abundance source of power of all. Geothermal is very sustainable, as demonstrated by one of the first modern sites that was established in Lardarello, Italy in 1904. That site is still producing power to this day! There has been a recent resurgence in interest. Geothermal currently produces 65% more power in the US than solar and wind combined. Its true potential is only just starting to be tapped by a few innovative companies. There is a lot of confusion as to what exactly clean tech companies and industries are. We define clean tech as anything designed to minimise any negative environmental impact and efficiently manage the earth's natural resources. Today, clean energy could be seen in the same unique position as the railroads were in the mid 1800s and as the internet was in the 1970s. A revolutionary process is in the making. The clean tech revolution is about new sustainable power distribution, made up of supergrids distributing power through a network of solar panels, wind turbines, geothermal plants and home efficiency technologies. 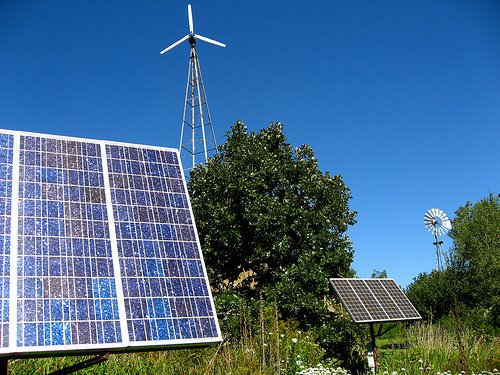 A vast amount of investment money is pouring into clean tech businesses annually. This is definitely where the "smart money" is going. Venture Capital investment in clean tech companies has increased 16 fold since 2001. Renewables such as wind, solar and geothermal have the potential to produce much of our energy needs by 2030. They are certainly a viable alternative to nuclear power. In addition to renewable energy, there are a number of other ongoing trends that will continue to be a challenge but also an investment theme in the coming decade. The UN says that more than 1 billion people are dependent on water resources that are hard to access, disease-ridden, or simply unavailable. Unsafe water, inadequate sanitation and lack of hygiene claims the lives of an estimated 2.2 million children under the age of 5 every year. The findings from the UN-Water GLAAS report were presented at the first annual High-Level Meeting of Sanitation and Water for All, hosted by UNICEF on 23rd of April 2010 in Washington, DC. This provided a forum for Ministers of Finance from developing countries, and the Ministers responsible for sanitation and water, to gain a greater understanding of the linkages between water, sanitation, and economic growth. It has been estimated that improved access to sanitation and water produces economic benefits that range from US$3 to US$34 per US$1 invested, increasing a country’s gross domestic product (GDP) by an estimated 2% to 7%. The United Nations Environment Program's "Sick Water" report points out that more people die each year from polluted water than from war or any other form of violence. There is clearly a long way to go to solve this problem. The good news is that this challenge is an investment opportunity that gives the potential for decent gains whilst at the same time helping to alleviate water shortages.